Die-cut cards feature a cut-out window on the front of the card, allowing you to display your company name through the opening. The Customizable Front (Ink Only) cards allow you to add text right on the front of the card. You are able to edit the font, color, and size of the desired text you’d like to add. If you prefer, you are able to create an image – that includes your company name – on the front of a Custom Photo-Mount Card. There are different options for the card’s orientation and color of the card stock. These are some of the card types which allow you to feature your company name on the front of the card. As always, the Gallery Collection carries a wide range of cards that are sure to fit your needs this holiday season. These options are ideal for a business. You want your name on front and inside. I think the photo mount cards are so classy looking. It is a nice touch to be able to put my business name on the design. Being able to put my company name right on the front of the card and have it look like it was meant to be there is fantastic. When clients and businesses receive holiday cards, they always display them in such a way that only the front of the card is visible to visitors to their office, etc. Having my company name be part of what others will see when looking at what is being displayed is a big plus to me! 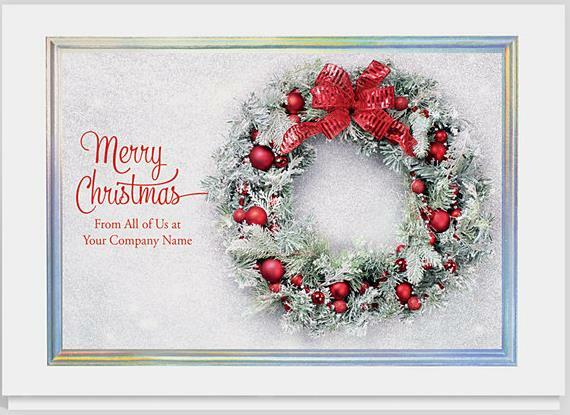 What a nice card and a great way to have your company name stand out before you even open the card. Next post: 11th Annual Create a Greeting Card Scholarship Contest – Round 5 Winners Announced!